Boil 2 cups of water in a medium-size saucepan over medium heat. Add the remaining ingredients, except the grits, stirring slowly. Bring to a boil, then reduce the heat. Slowly stir in the grits. Simmer, stirring every 5 minutes until the desired consistency is reached, about 20-25 minutes. Transfer grits to a serving bowl and keep warm. Mix all of the dry ingredients in a bowl until well mixed. Heat the oil in a large grill pan over high heat. Coat the shrimp in the seasoning mixture. Add them to the grill pan and cook until caramelized on both sides. 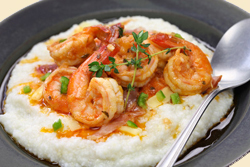 Remove them from the pan to a serving bowl and serve with the grits. Note: Adding cheese and/or gravy with fried onions will enhance this dish considerably.